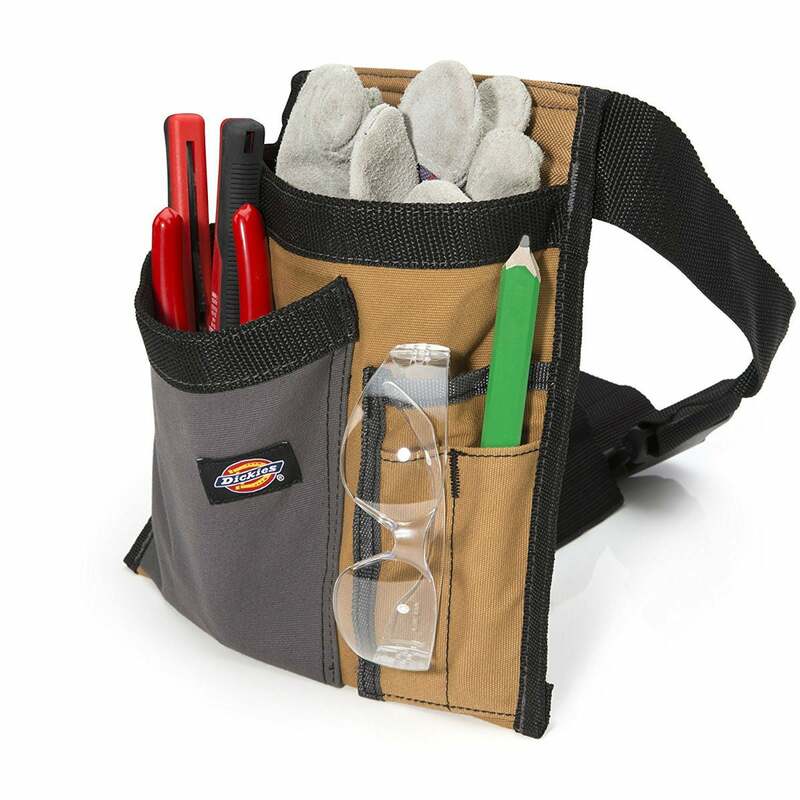 Keep your essentials organized and in reach with the best tool belt for your tasks, work style, and budget. The “do” is the fun part of doing it yourself. The time spent searching for the right hand tools, tape, and fasteners—especially halfway through a project? Not fun at all. Fortunately, a well-organized tool belt will keep all your essentials hanging right off your hips. And there’s no denying how buckling one on makes even a novice DIYer feel like a swaggering pro. Because tool belts come in various materials and designs, it’s wise to do a bit of research before buying one. Here you’ll find the must-know info—plus five quality options that win raves from satisfied folks like you. Tool belts are commonly made of different materials, some more rugged than others. Oiled leather and suede are sturdiest—but heaviest. Still, this is a good choice to avoid getting poked by pointed tools such as screwdrivers and chisels or simply want something rugged enough to last decades with proper care. 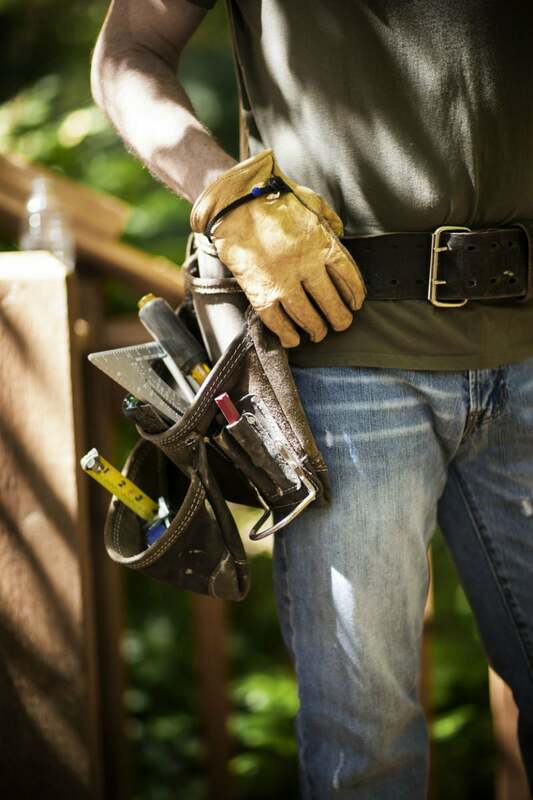 Lightweight polyester, nylon, or other synthetic materials don’t stand up to heavy or pointed tools as effectively as leather does, but for the casual or infrequent do-it-yourselfer, this might be a best-bet belt to carry a few basic tools. Heavy canvas, multi-layered polyester or nylon, or “pleather” often hits the sweet spot between the weight of oiled leather and the reduced durability of lightweight synthetics. A sturdy faux leather or polyester tool belt is a good choice for typical homeowners or do-it-yourselfers. Some tool belts have as few as five pockets, while others have more than 30, as well as other ways to carry essentials. A basic belt with five or six open pockets might be fine if all you need on you are a hammer, screwdriver, and a box of nails. 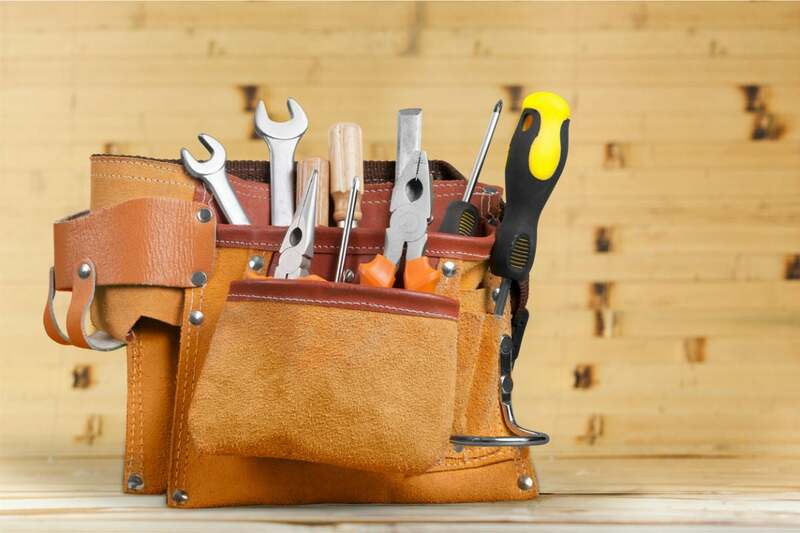 If your belt takes the place of a trusty toolbox, however, you’ll want something more versatile, with open pockets of varying sizes, zipped pouches, hanging loops, and clips that let you organize your go-to tools, right where you want them. Tool belts come in a few different designs, tailored to various tasks. One with hanging tool pockets over each hip, with a smaller center pocket for stashing tape, makes it easier to climb ladders or lean forward without the loaded belt catching or getting in your way—ideal, for instance, when painting. Those with a center apron-like pocket could get cumbersome if you bend or climb frequently, so are best avoided unless you only wear the belt occasionally for light tasks around the house. 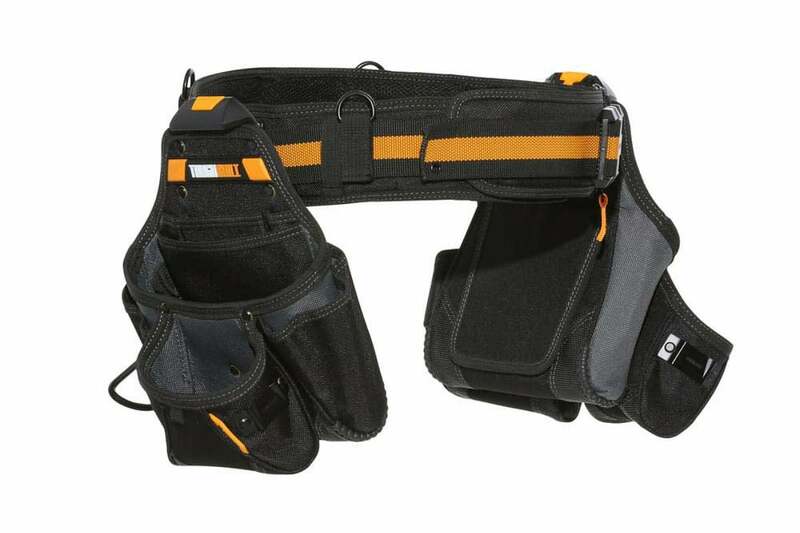 Tool belts with just one side pocket are a good option if you don’t carry much more than the basic hammer, screwdriver, and pliers, and want to be able to move freely while climbing ladders or doing other active handyperson tasks. Tool belts are one-size-fits-most. 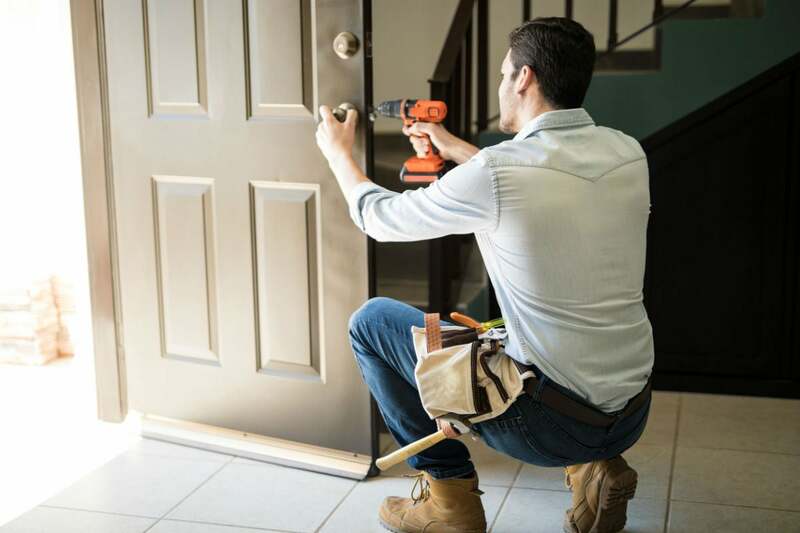 Unlike belts used to hold up your pants, tool belts are generally very adjustable in length, allowing a secure fit for waists or hips measuring between 30 to 50 inches or so. 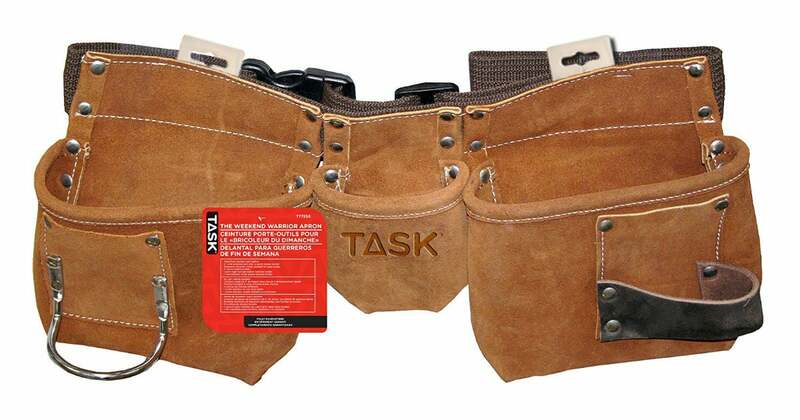 There are two basic styles of tool belt: those that merely clip around your waist, and those with suspenders or a harness attachment that lets your shoulders absorb some of the tool belt weight, thus relieving stress on your back. Unless you regularly wear your belt for several hours per day or have preexisting back trouble, a harness-style belt might be overkill. These next tool belts are the cream of the crop! Not only do they tick off your shopping checklist, but they also received high marks from happy customers. See if one of the five best tool belts offers just the organization you need, too. Made of six-layered super-rugged nylon, this very versatile belt can keep up with a pro—and earns 4.4 out of five stars on Amazon. It boasts a total of 27 pockets, loops, clips, and zippered pouches, plus you can clip the two multi-pocketed tool holders in front or on the sides of the padded belt, depending on the tasks at hand. There’s even an integrated “kickstand” to keep the tool belt standing upright when not around your waist. Adjusts to fit from 32 to 48 inches. With five pockets, the Dickies Work Gear Single-Side Apron is perfect for folks who only need to carry a hammer, screwdriver, pliers, tape measure, and perhaps a few nails. Its single-side design lets you move freely without pockets banging against your thighs. Constructed of heavyweight canvas, however, it’s anything but flimsy—this belt, which wins a whopping 4.7 out of five stars o Amazon, should see you through simple fix-it projects for years to come. Adjusts to fit from 32 to 52 inches. 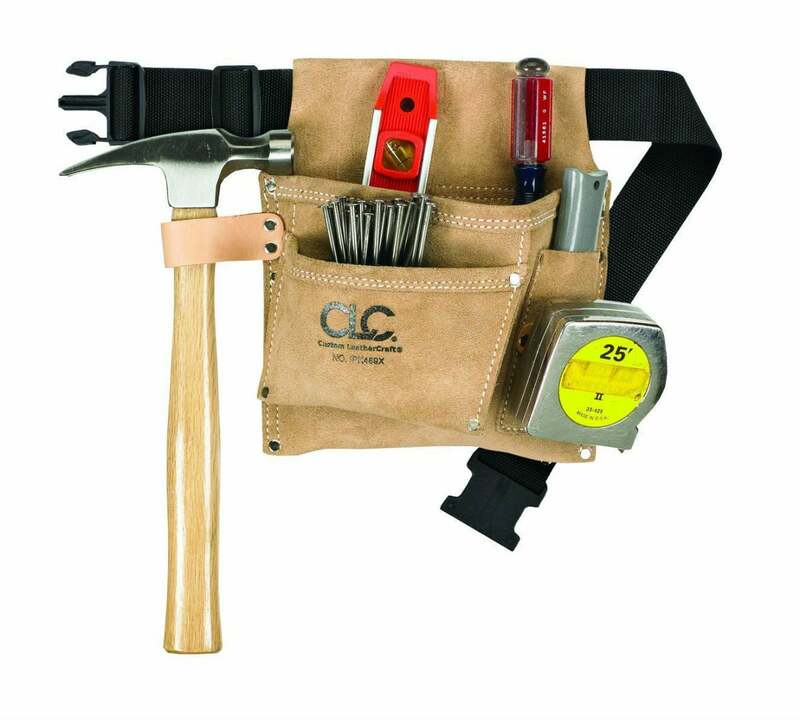 The CLC 3-Pocket Suede Tool Bag, designed with carpenters in mind, features a loop for your hammer, two deep pockets for holding nails, a measuring tape clip, and a smaller pocket for pencil, screwdriver, or other thin tools. The belt itself is made of heavy polyester, with a quick-release buckle for easy on and off, while the tool-holding portion is rugged suede. With more than 500 reviews on Amazon, it nets 4.4 out of five stars and fits waists from 29 to 46 inches. While the belt itself is made of strong polyester, the apron portion boasts durable split leather. That means it will hold your heavy-duty tape measures, hammers, electric screwdrivers, and other large tools, as well as scrapers, knives, nail kits, and other pointed utensils without damage. There are two hammer holders and five pockets of various sizes—enough to keep your essentials without weighing you down further. But this tough customer, which wins 4.2 out of five stars on Amazon, isn’t for small fry: It adjusts from 36 to 54 inches. You’re never too young to learn how to be handy, and with the Young Builder’s Leather Tool Belt, your child aged six to 12 can proudly assist you with projects and tasks around the house, yard, or garage. This durable leather tool belt has a quick-release clasp for easy on and off. The belt itself is durable polyester webbing, and the apron portion is suede. 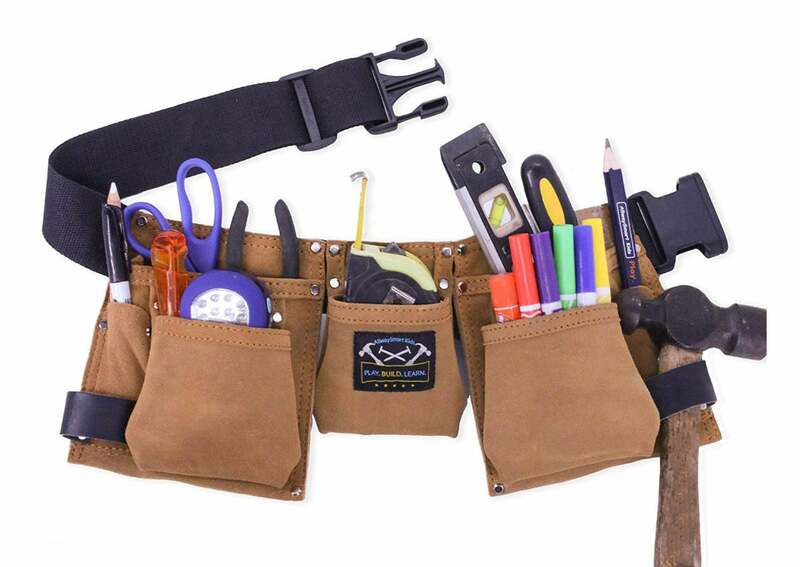 The scaled-for-kids tool belt, with seven pockets and two hammer loops, gets an impressive 4.8 out of five-star rating on Amazon and adjusts from 21 to 30 inches.